Many journalists already felt unsafe by the time a man walked into a Maryland newsroom and opened fire, killing five people. They had watched shootings unfold in movie theaters, churches, schools. Now, some said, they no longer feel safe in their own newsrooms. When the news broke, many feared not just for their friends, family members and colleagues — but for the future and safety of journalism as well. 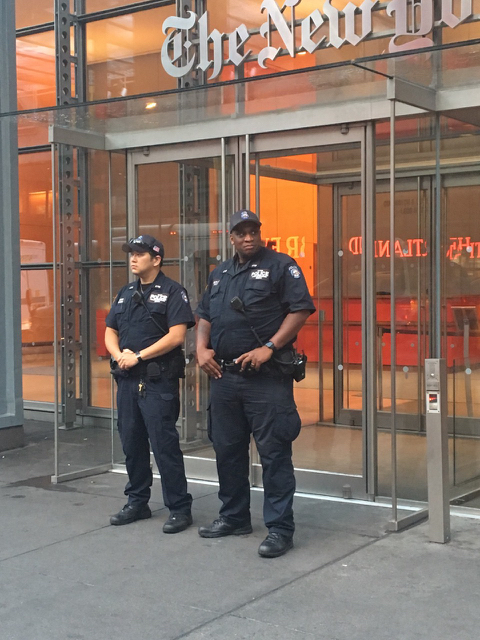 While The New York Times did not heighten their own security after the shooting, the New York Police Department made the unusual decision to send officers to guard their building and the newsrooms of many other outlets in the city. The Times also announced that an editor on its masthead would be responsible for reports of employee harassment, physical attacks or threats. Journalists who feel unsafe can report the incident and the editor will alert security, Ryan said. Other newsrooms have started conducting active shooter drills. On June 28, Jarrod Ramos, 38, walked into the Capital Gazette newsroom in Annapolis, Md., and opened fire with a shotgun, prosecutors have said. Five staff members were killed. Ramos, who is now on trial for 23 criminal charges, including murder, attempted murder, assault and weapons violations, has been described as a disgruntled reader with a history of harassing the journalists in that newsroom. Journalists are, by and large, used to receiving absurd letters from sources and readers. Some are nastier than others. Erin Ailworth, a reporter at the Wall Street Journal who usually picks up the office’s daily mail, was caught off guard by one particular note. But threats to journalists’ safety precedes the Capital Gazette shooting, said Vice President of News Services for CBS News Tim Gaughan. Ailworth has a friend who used to worked at the Gazette and knew the journalists in that newsroom. Ailworth said her newsroom had a security officer show them what to do in emergency situations years before the Capital Gazette attack. For some, like Gaughan, even after covering mass shootings across the country, he was oblivious to the possibility that his own workplace could be a target. Some journalists said President Trump’s comments calling media organizations “fake news” or “the real enemy of the people” has added to their anxiety.